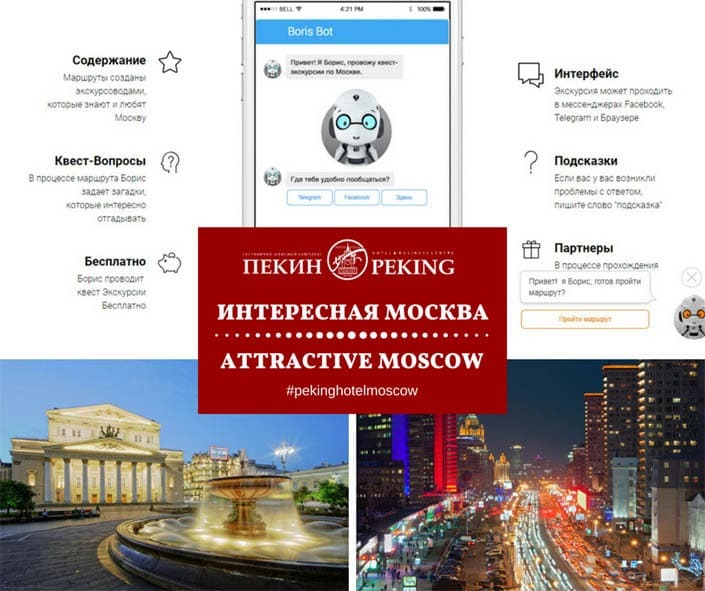 Boris the chat-bot is a real expert in interesting routes around Moscow, who asks you catchy questions and immediately responds to them. You can meet Boris by following the link. It’s working on computer, tablet or phone. This virtual guide, created for the World Cup, is ready to accompany you 24/7 on one of five routes: Kropotkinskaya – Kitai Gorod: from the Cathedral of Christ the Savior to the Romanovs’ Chambers; Kropotkinskaya – Luzhniki: from the central streets to the main stadium World Cup 2018; Smolenskaya – Arbatskaya round the historical sites; Arbatskaya-Tretyakovskaya round noble districts up to the Tretyakov Gallery, Metro Station Krasnopresnenskaya-City through the picturesque streets of the capital to the business center. Boris will tell you how to get from one place of the rout to another, show photos, inform about interesting facts and arrange quizzes. After the World Cup they promise to «teach» Boris new routes and quests for the Muscovites and guests of the capital!